Anyone with half an ounce of insight into the hockey world knew this moment was coming. But it didn’t make it any less shocking to process Friday night. 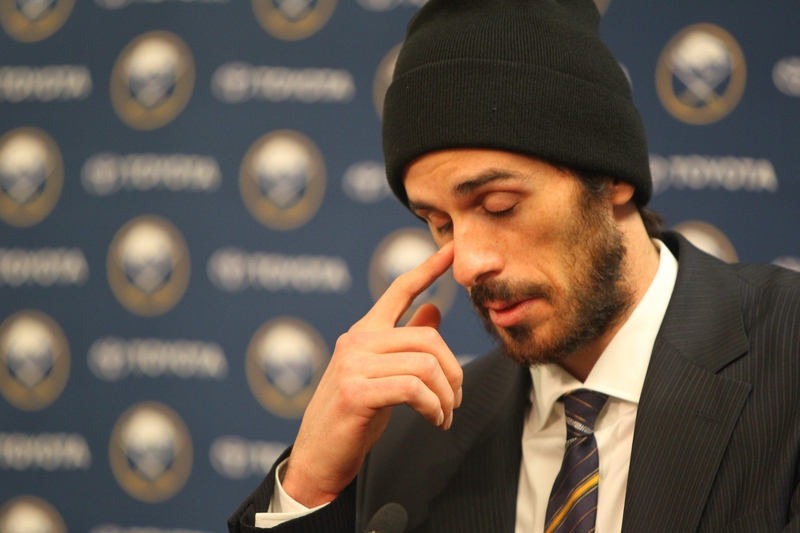 And it didn’t make it any less emotional for Ryan Miller. Miller is gone, off to meet his new teammates in St. Louis. Captain Steve Ott is joining him. The rebuilding of the Buffalo Sabres under Pat LaFontaine and new general manager Tim Murray has officially begun. Murray was triumphant after pulling off a whopper in his first deal as a GM. He said “there’s lots of future in it” when describing the moving parts of sending Miller and Ott to St. Louis for goalie Jaroslav Halak, winger Chris Stewart, prospect William Carrier and two draft picks – both of which could turn out to be first-rounders. But before moving on, this was a time to look back for Miller, the absolute face of this franchise for a decade. His eyes were sunken and his voice was low as he met with reporters. When he rubbed a tear from his right eye a couple of times, the clicks of photographers’ cameras were omnipresent in the room. “I don’t know if I’ll make it through this,” Miller said. You could almost see the flood of memories coming back to Miller. It all started in 2002 and it ended with Tuesday night’s win over Carolina, the 284th of his career in regular-season play. There were great times, like 2006 and 2007, and there were bad times. Certainly missing the playoffs in four of the last six years and being on a 30th-place team this year top that list. But he’s been a community pillar as well. His Catwalk for Charity event has become one of the must-attend events on the social calendar of young hockey fans. Miller thanked his teammates, thanked the fans, saved some special words for longtime goaltending coach Jim Corsi. But ultimately, he got what he wanted. He got the chance for the Stanley Cup. You know Miller was talking to David Backes and T.J. Oshie and Kevin Shattenkirk, his USA teammates in Sochi who play for the Blues. You know they were all secretly hoping Blues GM Doug Armstrong could pull this one off. And lo and behold, who is Miller’s coach now? None other than Ken Hitchcock, a brilliant hockey mind who is nonetheless always going to be a villain here for leading the 1999 No-Goal Dallas Stars past the Sabres in the Cup final. Murray got a 2015 first-round pick and he could get a 2014 one as well, if the Blues make the Western Conference final or if they re-sign Miller before the NHL Entry Draft in June. A whopper of a return. And with this deal, I’d say there’s a pretty good chance St. Louis makes the conference final. Right now, you might say Miller could make the Blues the ultimate favorite to win the Cup. Miller was supposed to play in Friday night’s game against San Jose, which I have said all week was a patently bad idea because of the risk of injury. But the Sabres were going forward with it until things heated up late Friday afternoon. The morning skate was normal. Miller took shots like he always does, finished by taking them from the defensemen. Skated to the center circle to do his stretching, holding the pose for a few seconds. Then at 10:50 a.m., he skated off the First Niagara Center ice for the final time. And he did it like he does every practice and period: a spin, a slap of his two goalie gloves, a tap of his stick atop the boards and then a step into the bench. There was no hint anything was up until 5:30, when Murray suddenly did not appear for his weekly interview on WGR Radio. What made that even stranger was that Murray had spent 20 minutes in the noon hour talking to The FAN 590, the all-sports radio giant in Toronto. By 6 p.m., there was chatter Miller was not going to dress. Before every single game he plays, he comes to the bench, minus his shoulder and chest pads, and stares to the ice in a sort of visualization exercise. He didn’t do it Friday and that was pretty much the last hint. Shortly before faceoff, fans in Section 313 put a “THANKS RYAN” sign on the wall at the end of the arena above their seats. The building was quiet and a murmur was noticed when Jhonas Enroth was announced as the starter and again when Miller and Ott were announced as scratches. The fans didn’t get to see Miller and Ott play but the Sabres did a great job with their farewells. Both players got thank-you tributes on the Jumbtron in the third period. When Miller’s was played with nine minutes left, the building erupted in a roaring standing ovation. There were chants of “Mil-ler, Mil-ler” and “Thank you, Ryan.”. Even the Buffalo players on the bench got on the feet to join in, tapping the boards in front of them with their sticks. The Sabres have always been strong in goal, and we’ll have to see what they do going forward. Halak is a pending free agent, and young prospects are a couple years away. From crossbar-grabbing acrobat Roger Crozier to Gary Bromley and Gerry Desjardins, to Don Edwards and Bob Sauve, to Tom Barrasso and Daren Puppa, to Grant Fuhr and Dominik Hasek, to Marty Biron and finally to Miller, they’ve always been set there. But when it’s really all said and done, it’s Hasek and it’s Miller. And then it’s everyone else who’s guarded the Buffalo net.